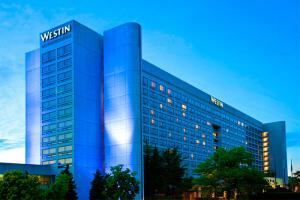 The Westin O'Hare is conveniently located just 5 minutes from the airport and 20 minutes from downtown Chicago. Fans of jazz, blues, sports, art and architecture will have plenty of intriguing options nearby. Guests can relax in the soothing atmosphere of one of the 525 spacious guest rooms, including 24 suites, a recently refreshed lobby, fitness center and indulge at the Benchmark Gastropub. Located just 5 minutes from O'Hare International Airport and 40 minutes from the McCormick Place Convention Center. Benchmark GastroPub - American cuisine. Fashion Outlets of Chicago, Brookfield Zoo, Wrigley Field, Shedd Aquarium, Navy Pier, Six Flags, Rivers Casino, Hummel Figurine Museum, Field Museum of Natural History.